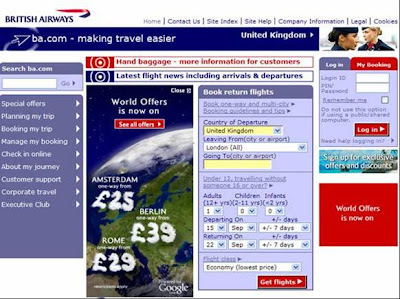 British Airways are using Google technology to promote the latest British Airways World Offers campaign. Google Earth is integrated into the BA creative execution and Google Earth imagery forms the basis for the British Airways World Offers outdoor, online display and TV creatives. 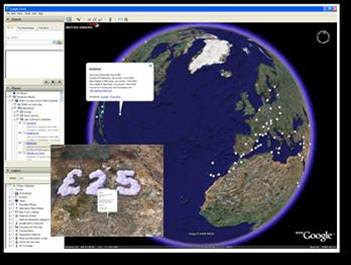 Google Earth is also integrated into the BA website and a British Airways KML layer allows Google Earth users to see BA flight prices (in cloud font) above cities. There are also links to BA travel guides etc. The British Airways tie up with Google Earth is a mutually beneficial partnership. BA wants to raise the profile of the ba.com internet offering and associating with Google Earth is a great way to improve BA's online credentials. In return Google see the Google Earth product promoted to a wide audience through a credible partner.